Experts have reported that in the past year alone, social video conglomerate YouTube has seen a 100% increase in its’ users’ mobile video viewing. So does that mean short-form content is king? Not necessarily. Content creators, video marketers and advertisers alike might be pleased to know that mobile video viewers are actually continuing to view long-form content on their mobile devices. Hence, for brands playing the digital video field, the task at hand is to engage, engage, engage. On some “micro-form” mobile-first apps, such as Snapchat, Instagram, Periscope, and Vine, the video culture is predominantly short-form, and so brands must learn to condense and engage at once. Overall, compelling content is king—and the more interactive and socializing it can become, the better for the mobile community. In the perpetually-distracted world of mobile, brands should seek to ditch the “sales pitch” in favor of influencing content (think collab, or even narrative-style) to break through the saturation. Casting known “influencers” within the social media sphere can also help drive views while staying true to native audiences. Sources say that ad spending is projected to grow three times as fast for mobile digital video over desktop, as advertisers and content creators compete to follow their audiences’ new viewing patterns. Desktop digital video still isn’t far behind, with over 40% of desktop ads in more engaging, eye-catching and informative digital video formats. Cisco projects that by the year 2018, 70% of all internet traffic will be video content. So how can your brand get noticed and stay relevant? For video marketers who may be looking to forego the increasingly expensive video ad placement route, more and more brands are creating quality, entertainment-based and narrative content featuring their brand. Within the video, companies have expanded with various ways to blend in the CTA—some incorporating in-video annotations [box links], some waiting until the end slate credits, and others preferring to keep the CTA excluded altogether in favor of long-term or indirect conversion. 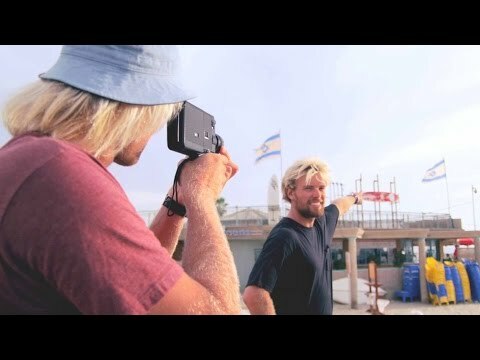 Here’s a sample of a branded lifestyle video produced by the Highlight Films video marketing production team—“Down Days Tel Aviv: The Middle East City by the Sea” for Red Bull TV and Vans.